srIman nArAyaNan, out of his unconditional grace, blessed certain jIvAthmAs and made them AzhwArs (those who are fully immersed in bhagavath anubhavam). Those AzhwArs took up to emperumAn‘s mercy and sung many thamizh poems which are collectively called as 4000 dhivya prabandham. Among those dhivya prabandhams, thiruppallANdu which is sung by periyAzhwAr is considered as the most important one. 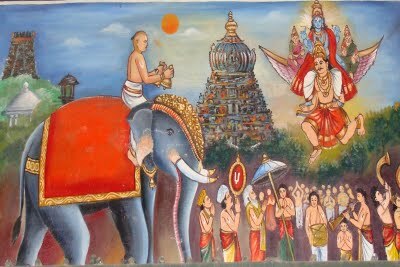 periyAzhwAr goes to madhurai (south) king’s court to establish vishNu parathvam (supremacy of vishNu). After successfully completing the task by the grace of emperumAn, he is greatly honored by the king. At that time, emperumAn himself descends there to see periyAzhwAr being celebrated/glorified. 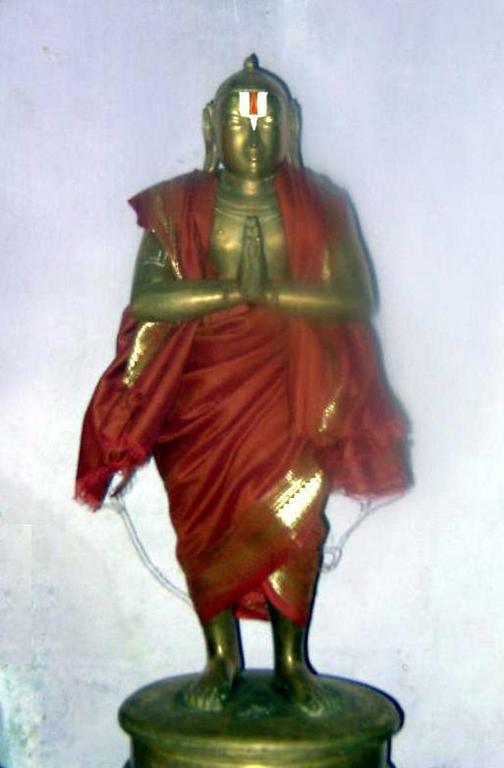 Seeing emperumAn in this samsAram (this material world which is full of dangers)), periyAzhwAr sings thiruppallANdu seeking protection for emperumAn. In upadhEsa raththina mAlai, maNavALa mAmunigaL highlights the greatness of this prabandham in his 19th pAsuram. thiruppallANdu is to be recited in the beginning of the recital of flawless dhivya prabandham just like praNavam is recited in the beginning of vEdham recital. This is because thiruppallANdu is the essence of all dhivya prabandham (as praNavam is the essence of vEdham) and it is focussed on mangaLAsAsanam to emperumAn. pallANdu means seeking out for the well-being of some one. In samskritham it is identified as mangaLAsAsanam. In srIvachana bhUshaNa dhivya sAsthram, piLLai lOkAchAryar elaborately explains the glories of periyAzhwAr in comparison to other AzhwArs. periyAzhwAr is glorified as fully focussed on seeking out for bhagavAn‘s well-being in comparison to other AzhwArs who some times look at emperumAn and other times look at their own sufferings in this samsAram. vyAkyAnam for thiruppallANdu is written by periyavAchchAn piLLai who is glorified as “vyAkyAna chakravarthy”. We will start seeing the English translation for this wonderful dhivya prabandham. 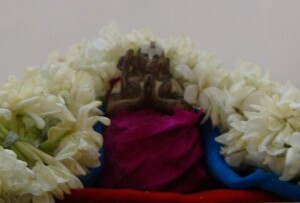 This entry was posted in mudhalAyiram, thiruppallANdu on June 3, 2015 by Sarathy Thothathri. could you pls. upload ? Please check http://divyaprabandham.koyil.org/index.php/e-books/ . All e-books are available from there with working links. thanks for the feedback. found the links.